The giveaway is now closed. Thank you. This is essentially Part Two of the nail polish giveaway that I kicked off two weeks ago. 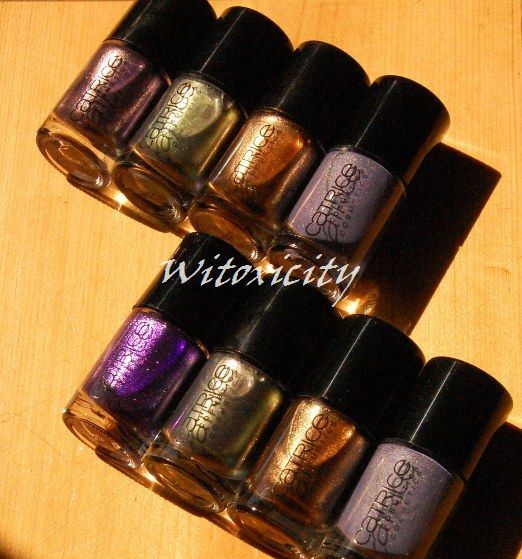 I've just concluded the one featuring Essence polishes and now, it's the turn of Catrice. I'm very impressed with the latest release of Catrice nail polishes. They are affordable, there is a varied and gorgeous range of shades to choose from and I don't really have anything bad to say about its quality either. There are two packages up for grabs. Both packages are the same except for one polish. 3. Fill in the form below (now removed). Please choose which package you would like to win - Package 1 with Purplelized or Package 2 with Forget-Me-Not. 4. Optional: Feature this giveaway on your blog (feel free to use the first image) - one extra point. 6. Optional: Follow me on my style site, Witoxichic, through either Google Friend Connect or Bloglovin' - one extra point. 7. Readers who have been regularly leaving comments on Witoxicity and Witoxichic: You have already bagged one extra point. 8. Submit your entry by latest 11.59pm (Central European Time) on Friday, 24th June 2011. I've decided to let the giveaway run for just under three weeks instead of the intended two. If you can't make up your mind which package to go for, try checking the two purple Catrice polishes through my Nail Polish Gallery. Good luck everyone, you never know you could be the next winner!! I'll sit this one out too as going for just one colour is inappropriately greedy :p. Good luck to all who enter :D! Lol if only! But I do have to correct myself: I now have all the colours you're giving away, so now I'd just be evil if I entered :p. I'd rather give someone else the chance to win something nice :D! My friend has a bunch of Catrice nail polishes that I tried and i fell in love with! I'm totally joining! Hi! I found your blog just this morning via a link at makeupalley... I just stopped biting my nails about 2.5 months ago, so i'm searching for nail care info and holy moly! i'm going to end up spending all morning (or, well, most of naptime later this afternoon) going through everything here! Thanks for taking the time to blog about all of this, nail n00bs like me need all the help we can get! hmm, i think my original comment was lost. Anyway, i found your blog through makeupalley searching for nail care advice- i stopped biting my nails about 2 months ago and am trying to find all the info i can on nail care. Love your blog! thank you for taking the time to write out so much info on everything! Thanks for this giveaway! Beautiful polishes! Another fantastic giveaway as always. I've been a bit busy for a while but now I'm ready for your new giveaway. Thank you girl and good luck to everyone!! I couldn't remember if I already entered so please excuse me if I entered twice. :/ Thanks for this great opportunity! and my favorite package is the number 1!